The NightRod was a total stunner of a bike, a real-head turner, but utterly impractical in every scenario you can think of, impossible to lean over more than 5 degrees without scraping something and no fun at more than 70mph due to oppressive wind blast. At any rate – last August a job change beckoned and I started a new role in sunny El Segundo which meant a 45-mile commute each way, up and down the 118 and 405 freeways. Relocating was off the cards, as was me spending 3-4 hours sitting in traffic every day so I started researching my options for a decent two-wheeled commuter. I narrowed it down to just 3 (a Yamaha FJ-09, the Honda NC700X and the Versys 650) and after testing them all, plumped for a brand new 2015 Kawasaki Versys 650 LT, which I took delivery of a little over a year ago. This is a 25,000 mile review because yes, in a little over a year, that’s how many miles I’ve put on the Versys…! I’m not going to review the bike as it was new because that’s been covered in a million reviews on other motorcycling sites – but any readers that are shopping around for a good second hand motorcycle may be interested to read my experience with the Versys one year and 25,000 miles in. Other than a Kawasaki top case and a Kawasaki LED Light Bar I had the dealer install before I took delivery, the bike was stock. I use the bike for two things – primarily as a commuter to get me to and from home (Simi Valley) to work (El Segundo) each week day and then as a toy for fun on the odd weekend going for a blast through the canyons, Mulholland, PCH and Los Angeles Crest Highway and surrounding countryside. The first thing to mention is this bike is well named. Versys (a concatenation of VERsatile SYStem), Kawasaki designed a versatile machine that can do anything asked of it. It’s worth noting that it doesn’t EXCEL in any one area – moreover it is just very good in all of them. As a commuter machine, it is not far off the perfect bike. Light, predictable handling, comfortable, tall, plenty of low down torque, ABS brakes (front and rear), handguards and an adjustable windshield are all great attributes for a commuter to have. Add in tons of storage thanks to the two (stock) 28 liter side panniers and even more on mine thanks to the 47 liter top box and you’ve got a really strong all-round commuting package that will waft you to work and back through the worst LA rush hour traffic with comfort and ease. The handling and power characteristics also make this a fun machine in the twisties. It’s got nothing like sports bike top-end and power but the handling is smooth and predictable. Coupled with the stock Dunlop RoadMax tires which offer decent grip (or even better – a set of Pirelli Angel GT’s once the Roadmax’s have worn out :-), the Versys will keep up with anything in the corners. 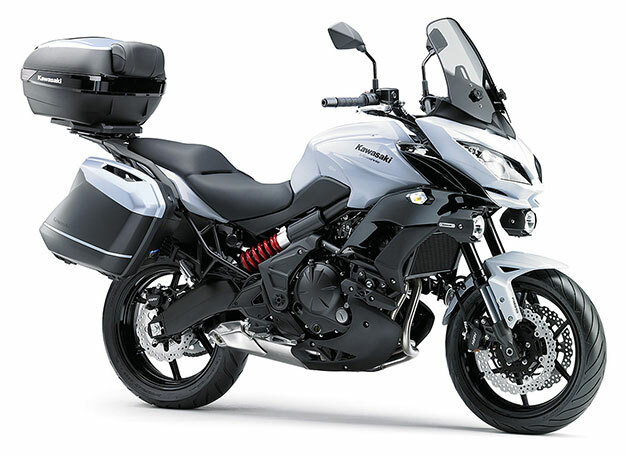 On the negative side, I feel like a bike of this nature really should have a center stand as standard (it does come as an optional extra), especially as the market the Versys is aimed at (touring / commuting) is a high mileage group, which means more regular servicing & maintenance. Things like tire pressures, tire checks, chain cleaning, oil and filter etc are all much easier if you can pop the bike on its center stand. As it is, I had to source and buy after-market spools which screw on either side of the swingarm. I then had to purchase a motorcycle stand in order to lift the bike up off the ground for servicing and periodic routine maintenance. Since the bike is aimed at touring / commuting and high mileage riders, cruise control would have been a nice addition – even as an optional extra. The other critical omission is a tire pressure warning light (surely a necessity for any large, modern motorcycle??) and a more accurate fuel warning light (it’s a 5.5 gallon tank and the warning light comes on after 3.5 gallons has been used). I do other intermediate servicing myself (oil and filter every 3,250 miles) and I clean and lube the chain every weekend. So far all all the bike has needed in terms of replacement parts has been a new chain (at 14,000 miles) and a new set of tires (at 20,000 miles). Sprockets look good even at 25,000 miles so there are no plans to replace these at the current time. Suffice to say I’ve been very impressed with the Versys over the long term. I’m not sure if other Versys owners have reported more problems, and admittedly most of my riding is pounding up and down freeways or threading through traffic, but I make sure I keep the Versys well maintained and the bike seemingly rewards this with very low wear on parts and low running costs. If you are in the market for a rock-solid second hand bike, the Versys would be a superb choice. You said you had the valves checked, did they need any work on them? Could you omit the valve check? 15,000 miles is a valve adjustment service (per the manual). I’ve had 3 now as I’m up at over 45,000 miles. The valves have needed adjusting each time – only 2 at 30,000 miles. All four needed tweaking at 45,000. Not by much but there was still an adjustment needed. It makes a big difference getting it done. Engine is noticeably smoother. I wouldn’t recommend missing this service at all, nor would I recommend performing it yourself as you have to practically take the bike and the engine apart to do it. Its my 5th versys and can’t recommend them highly enough…I always ride with bikes much bigger and have no problems at all whether on the motorways or in the mountains….! If kawasaki put spoked wheels on this bike and maybe a 700cc increase (although not needed) they would be on in a real winner..!